Atlantis Research along with Kennedy Space Centre organises Space Settlement Design Competitions every year at the International level. ‘The Indian National Space Settlement Design Competition’ was held for the first time this year. The qualifying round was an online based competition where each registered school had to submit a 40 page project according to the given Request For Proposal (RFP). National Public School, Gopalapuram along with 43 other schools all-over India participated in INSSDC. 11 students took part in the qualifying round. The students submitted their proposal on October 7, 2017. The results of the Indian National Qualifying round was announced on October 11, 2017. The students were overwhelmed that NPS, Gopalapuram was one of the 25 schools selected. 7 students out of the 11 went to the final round held in Om Shanti Retreat Centre, Gurugram, from 2nd to 5th November, 2017. The final round was a live competition where the 25 schools were split into 5 companies. NPS, Gopalapuram was a part of Vereingten Flugfahrten. The companies were given a contract of designing a space settlement on the Earth’s Moon. The new RFP was given on November 4th, 2017. The companies were expected to submit their proposal on November 5th, 2017. A few selected members from each company had to present a Power Point presentation of their proposals for 35 minutes. The result of the finals was announced on the same evening. Vereingten Flugfahrten was awarded the runners up. Before the competition was adjourned all the participating schools were awarded with trophies and students were given certificates and mementos for their participation in the finals. NPS, Gopalapuram is now qualified to participate in the Asian Regional Space Settlement Design Competition, to be held on January 19, 2018. 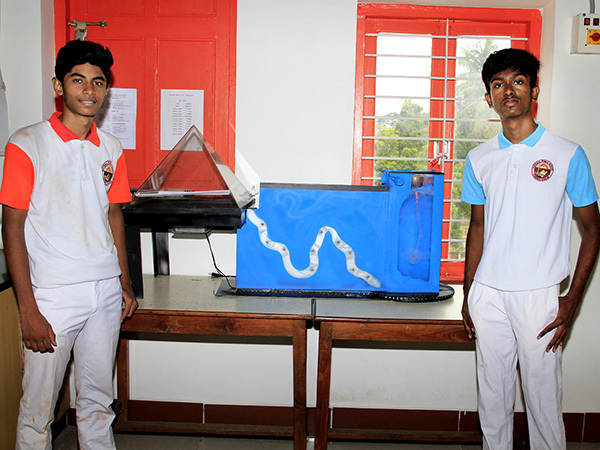 S. Hridayesh Kumar and Sameer Abdul Shaik of Grade 11 from National Public School, Gopalapuram, were awarded the first place in the state level competition that was conducted by the Ministry of Science and Technology, Government of India on the topic ‘Ocean for the society’. The honourable Vice President, Shri M. Venkaiah Naidu graced the occasion. The competition was held in 2 stages, the first stage was held at the Birla Planetarium on October 5th where around 130 schools participated and 520 projects were displayed. The top 20 selected projects were displayed in Anna University from 13-16th October at the India International Science Festival (IISF) in the Grassroots Innovators Summit. The 2 students worked on the project in two divisions. Hridayesh worked on the Physics department (desalination and electricity generation) and Sameer worked on the Biotech department (conservation of coral reefs). Hridayesh invented a desalination plant that produces fresh water as well as electricity . He also designed a separate electric generator which could be installed in the middle of the ocean. The principles behind this project were variation in pressure under water, green house effect, steam engine, black body absorption and refractive index. The desalination plant uses only solar energy for evaporation with a rate of 1.23 L/s and the electric generator utilises the rotatory motion of a body when placed in the middle of the ocean. Sameer discovered a way of yielding out calcium ions from water and strengthening the exoskeleton of corals. He also invented a way to discourage the overgrazing by using nitrogen capsules and induced a conditional cnidarian reflex involving its own defence mechanism. The process does not affect any recreational activities in the ocean.